Where did this week go? I am hoping yours was more productive or at least more fun than mine. I have the feeling that mine flew out of the window and was eaten by a hungry giant bird. It has been a bit fragrant lately on the blog due to the fact that I don't use make-up when I am sitting in front of the computer at home, alone! For a change I went to work yesterday and right now I am sitting in a train to Munich for an event so I started using some make-up again, let's hope that those reviews are coming very soon. At the end of last year I had the chance to try the new perfume line of a fashion legend Diana Vreeland who is also happened to be known as the "Empress of Fashion". Decades after her death, her grandson Alexander Vreeland honored her legacy and brought her back in bottles. Diana Vreeland Fragrance Collection was launched in 2014. It has eight fragrances designed by renowned noses. In its deep violet bottle, Daringly Different called my name and touched my skin many times this winter. Here are my thoughts about it. Vreeland Perfumes positions itself in the exclusive and luxury segment. You can find the line in Bergdorf Goodman and Neiman Marcus in the States, in Selfridges in England, Colette and Le Printemps in France as well as Corso Como in Italy. In Germany Vreeland perfumes are available in Apropos-Stores and Quartier206 in Berlin. The heavy glass flacon is as hefty as its price tag, 50 ml sets you back around 160€. The cap is magnetic and sits nicely. Try leaving it at an angle, it is funky. It has the logo of the house and a cute tassel right under it brings an oriental touch to the experience. Daringly Different opens with a whiff of violet and iris mix which gives the impression of being brought by a dry wind. The floral opening linger on a smoky fireplace thanks to oud entering the picture as early as the top notes. Rose stay at the background as tonka beans are almost barely there on my skin. Although top notes hint a grand opening, with heart and base Daringly Different get more and more quiet, read less projection and more wearability. I am sure an easy to wear oud fragrance with a touch of smokiness and elegance of rose and iris will please many but I would prefer a tad of more staying power and sillage. All in all I find Daringly Different not to be all that different and daring but wearable and pleasant to daily oud lovers. 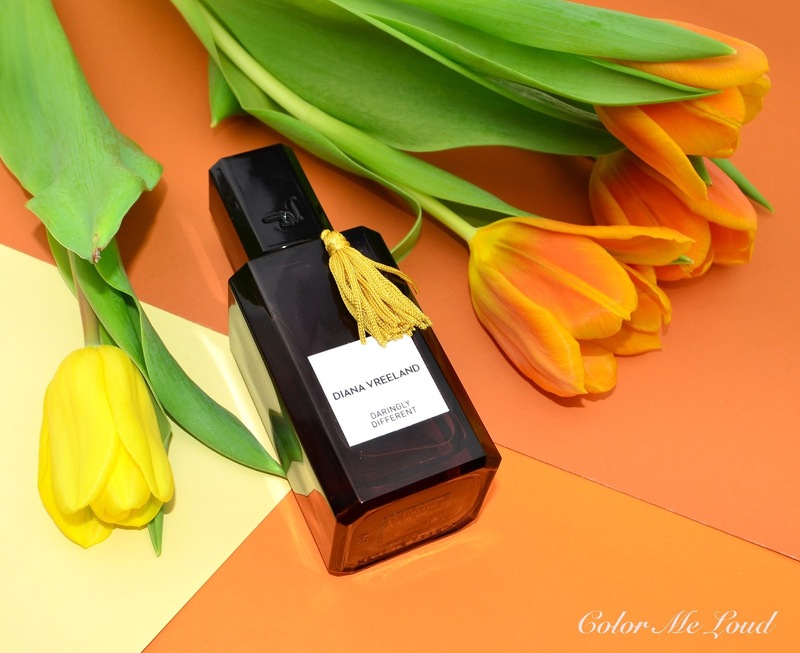 Final thoughts: Diana Vreeland Daringly Different is a combination of the warmth of oud and elegance of rose and iris. The opening reveals itself like a loud perfume although the compositions settles to have more of a wearable quality soon. It is for those of you who would like a touch of iris on a smoky oud bed without turning heads. 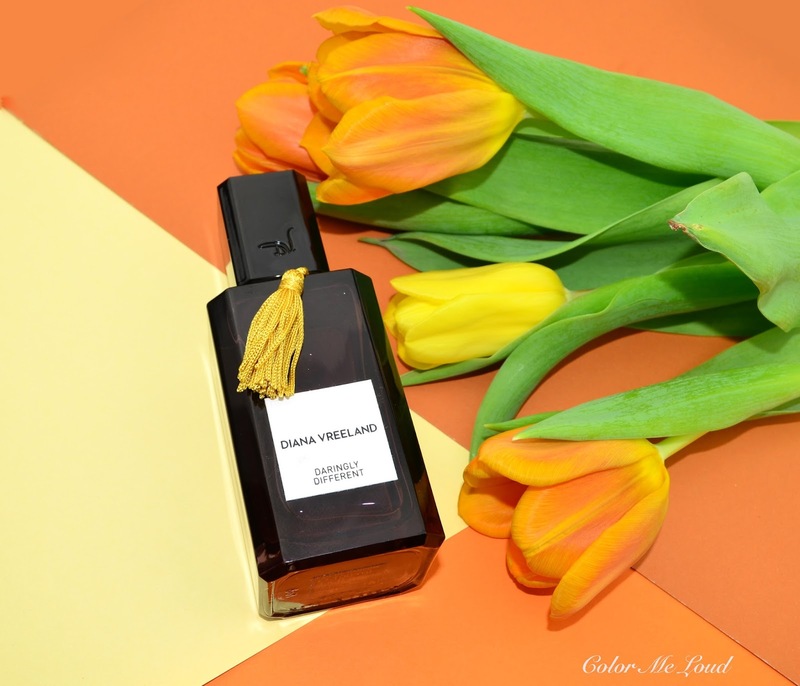 Have you heard of Diana Vreeland line? Do you like oud fragrances? Fascinating reflections and reminiscences. Vreeland's grandson was married (and had 2 kids) with the daughter of a friend of mine, who came to a very tragic end, and he kind of bailed as she was declining. Very sad. The rich and the famous often have a shadow side. Ohhh I love oud, and this one sounds lovely!! I hadn't seen these around in Singapore though, and I'm almost afraid to go hunting for it... *sounds of notes flying away*. I've actually not been feeling up to wearing any fragrances lately.... my nose just can't seem to take it. And when I'm working from home, I can't be bothered to put on any. LOL! Are you working at home more frequently now? I am so crazy about perfumes, I even wear them at home. Although, while at home, I try doing strange combinations and it all end up to stink in the end haha.